My sister, brother-in-law, (Gerry and Roger Barnes), and I purchased this unit on June 15, 2018. 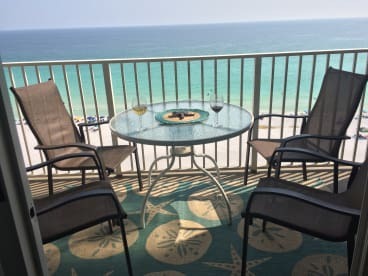 We have vacationed in Destin for many years and have long desired to purchase a property in a resort condominium that would offer us, and our guest, fantastic amenities, beach front, view, and comfort. We think we have found that special place at Majestic Sun on Miramar Beach. Majestic Sun has indoor/outdoor pools, hot tubs, on grounds restaurants, shopping center, arcade, exercise facilities, gift shop, bike rentals, a stocked, (catch and release), bass lake, a beautiful golf course, and much, much more. Our condo is a 1 BR, 2 B and has been completely remodeled with new king size mattress in bedroom, comfortable hall bunk beds, a new queen sleeper sofa and will comfortably accomodate a family of 6. Since we are from Louisiana, and our state bird is the brown pelican, (also seen in great numbers in Florida), we have named our place Pelican's Perch. We don't think you would be disappointed in this property, but if you were, we would definitely want to hear from you.